It’s essential that you buy a pink diamond from a vendor with high-quality photos like James Allen. Color can vary greatly even within a specific GIA color grade. In our experience, Leibish & Co. has the best prices and overall customer experience in the Fancy Color Diamond market. Additionally, Leibish & Co. has the highest level of expertise in bringing out the maximum color of the stone when set in jewelry. Gemologists aren’t entirely certain how the pink diamond obtains its color. Unlike other stones in the Fancy Color Diamond family, pink diamonds don’t contain impurities that they derive their color from. Various theories have been presented regarding the origin of the diamond’s unique hue. Some suspect that the enormous pressure undergone by pink diamonds during formation is a likely cause, though others believe it could be related to a seismic shock that impacted the stone’s molecular structure. Though the exact cause of the pink diamond’s color remains unknown, it offers the world a beautiful stone for engagement rings, bracelets and earrings. The shade of a pink diamond is graded according to its intensity and strength of color. In addition to its main hue, pink diamonds can have a secondary color or overtone, such as purple, brown or orange. Evaluating the intensity of a pink diamond is quite difficult, as each Fancy color grade isn’t simply a point along a line: each grade is a range in itself. We suggest contacting a diamond expert to ensure you’re getting the right value for the price. You may also encounter pink diamonds being referred to on a point scale from 1-9. For example, a vendor may rank a pink diamond a “7” based on its color and saturation. This is the Argyle color grading system. The GIA grades are usually standard, though. As with most Fancy Color Diamonds, the richer and more saturated the color, the more expensive the diamond. Though pink diamonds can be found around the world, the largest cache is located in the Argyle mine in Western Australia. The beautiful gemstone is still very rare, with only a few produced each year. Due to marketing efforts to sell pink diamonds, and Ben Affleck’s proposal to Jennifer Lopez with a pink gemstone in 2002, prices have risen significantly. With the exception of red diamonds, high-quality pinks are the most expensive natural diamond color in the market today. 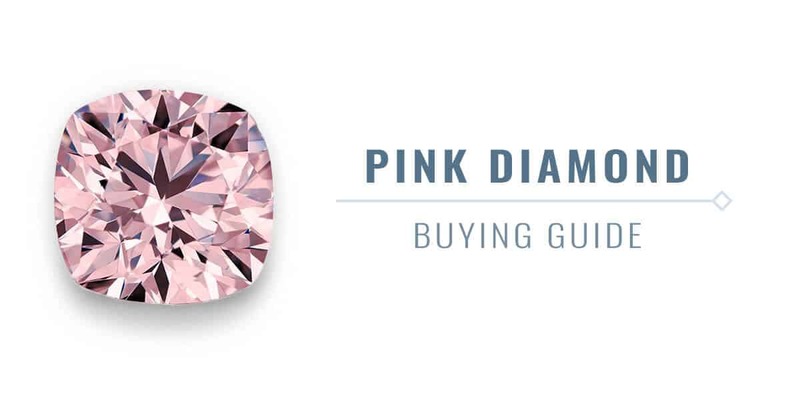 Pink diamonds skyrocket in value and price as their size and color intensity grows. Having a clear budget in mind prior to looking at diamonds and jewelry will help narrow your search. In addition, you’ll want to decide what kind of color intensity you desire. The color of a pink diamond along with carat weight have the greatest impact on the price. As an example, this 0.60 Carat Flawless Fancy Light Orange-y Pink Oval Cut costs $10,900, while a 0.68 Carat SI2 Clarity Fancy Purple Pink Oval Cut costs $51,100! As you can see, making the jump from Fancy Light Pink to Fancy Pink multiplies the stone’s cost dramatically. The jump to Fancy Intense Pink from Fancy Pink is generally less severe. Here you can compare a 0.35 Carat Fancy Purple Pink Round SI2 Clarity stone for $14,100 to a 0.33 Carat Fancy Intense Purplish Pink Round I1 Clarity stone for $18,250. Likewise, here’s a 0.40 Carat Fancy Purplish Pink Emerald Shape SI1 Clarity stone for $16,100 vs. this 0.39 Carat Fancy Intense Purplish Pink Radiant for $23,500. These aren’t exact comparisons, but considering the extreme rarity of these stones, it’s often impossible to find perfect matches. The jump between Fancy Intense Pink and Fancy Vivid Pink creates a similarly large price gap. This 0.59 Carat Fancy Intense Purplish Pink Round Diamond costs $59,100, while this 0.62 Carat Fancy Vivid Purplish Pink Round Diamond is priced at $260,500. In most cases, the price leap from Intense to Vivid grades is severe. The secondary or modifying tone of the diamond can also impact pricing. If a pink diamond carries a purplish modifier, the diamond would probably be priced slightly less than a pink stone without a color modifier. Due to their eye-catching hue, pink diamonds make for stunning rings. Below are three styles of pink diamond engagement rings to consider. Pairing your pink diamond with side stones is an excellent way to boost the size and sparkle of your ring, especially if your colored diamond is less than 0.50 Carat. Enhance the color and size appearance of your pink diamond with a halo setting made of small round brilliants. Adding a second layer of small stones to your ring can highlight your pink diamond even more. In addition to engagement rings, pink diamonds make for beautiful and unique necklaces, earrings and bracelets. For assistance in reviewing pink diamonds or selecting jewelry, contact one of our diamond experts today. Leibish & Co is the industry leader in the world of Fancy Color Diamonds. Their inventory size and prices are the best in the business, and their expertise in this highly specialized field will ensure that your diamond is set in a way to maximize its color.